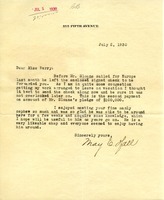 May E. Hall tells Martha Berry that she is sending a check from Mr. Sloane to her since Mr. Sloane has left for Europe and Ms. Hall wants to make sure the check is not overlooked later on. This check would be the second payment towards Mr. Sloane's pledge of $100,000. Mrs. Hall also mentions to Miss Berry that she enjoyed meeting her nephew and that she hoped he was able to acquire some knowledge in the few weeks he stayed with her.